There is a feminicide in Ciudad Juárez. Feminicide is the systematic gender-motivated murder of women. Since 1993, more than 600 girls and women have been tortured, raped, and murdered in and around Cd. Juárez, a city in northern México that shares a border with El Paso, Texas. Thousands of missing women from this area are also believed to be victims of this feminicide. The victims are typically poor women between the ages of 10 and 30 with reddish–brown skin, slender body types, and dark flowing hair.Many, but not all, of the women victims were employed in one the many maquiladorasin Cd. Juárez, factories on the U.S.–México border run by foreign companies. The common social, economic, and physical characteristics of the victims suggest that the perpetrators specifically target women who fit this description. Further, the ritual mutilation and symbolic placement of murdered bodies around the city indicates that drug cartels, among other organized crime groups, use the bodies to “mark their territory” in the bloody battle for money and control at the U.S.–México border. The manifold social, political, and economic causes of feminicide, and their theological implications, are thoroughly treated in Nancy Piñeda-Madrid’s forthcoming monograph,Suffering and Salvation in Ciudad Juarez (Fortress Press). A late draft of this work convicts me to write about the matter as a means of conscientization. Here, I pay particular attention to the popular forms of resistance to feminicide, especially the installation of pink crosses in significant public spaces throughout Juárez. Posted in important public spaces, pink crosses are displayed as a visible resistance to the feminicide. In 2002, the anti-feminicide coalition known as Ni Una Más (Not One More) installed a large pink cross at the Paso del Norte bridge, the main passage between Cd. Juárez and El Paso. It serves as a testimony to the crimes against the women and community of Cd. Juárez and a protest against the ongoing violence and systemic injustice that perpetuates the violence. This pink cross is echoed throughout the city and the surrounding desert, where activists install them in places where women’s bodies have been found. Adorned with flowers and the victim’s name written in black on the crossbar, these crosses remember the lives lost to the hate-filled vie for control between organized crime, government factions, and other economic interests. Further, the crosses are a way of reclaiming the territory marked by the drug cartels, dislodging their sign of death with Christ’s sign of solidarity in suffering and eternal life. 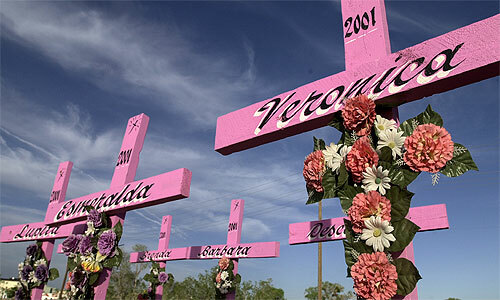 The pink crosses installed by anti-feminicide activists gesture to Christ’s crucifixion, resurrection, and the saving significance of these events for the women of Cd. Juárez. The reference to Jesus’ crucifixion is obvious in light of the brutal and unjust nature of these murders. Hundreds of pink crosses displayed throughout Cd. Juárez are a painful reminder of the women brutally taken from their families in the perverse power grab and pursuit of profit in this region. Like Jesus Christ who suffered “under Pontius Pilate,” these crosses gesture to the unjust system that stands flat-footed in the face of the devastation of an entire society and generation of young women. They signify the community’s mourning and longing for release from the violence. Identifying the suffering of their sisters, and their communal suffering, with Christ Jesus, the women and men of Cd. Juárez invoke a God who suffers in solidarity with the people, experiencing the brutal torture and inhumane violence born of hatred and contempt for life. These crosses do not glorify suffering; they lament it while recognizing Jesus’ choice to accompany us in our pain. Jesus’ suffering is not meaningless; it transforms all reality. Thus, the pink cross ought not prompt us to falsely glorify suffering in itself, but to question and resist the forces that permit and perpetuate it, recognizing that all such forces will be displaced by the gospel enacted in the lives of Christians. In the midst of this mourning, however, the women and men of Cd. Juárez still find the strength to “lift high the cross,” a gesture that continues to acknowledge suffering, but looks with hope towards the already-and-still-approaching salvation of Jesus. While the cross itself ought to sufficiently invoke both Christ’s suffering and resurrection, this message has often been lost in Church preaching and practice. By painting the cross pink, the anti-feminicide activists highlight the hope for resurrection promised by the cross. The pink color reminds us of the third week of Advent, when the Church lights a rose-colored candle to signify our hope in the midst of our waiting. We wait not in stagnation or paralysis, but in joyful hope that stirs us towards action, even if the face of grave danger. As the martyrs of the Church spoke and lived truth in the face of injustice and death, the Cd. Juárez anti-feminicide activists defy forces that seek to undermine life. Through hopeful protest of the pink cross, these women say Ni Una Más to death and violence in Cd. Juárez. Diana Washington Valdez, ¨Mexico on Trial in Murders of Women,” El Paso Times, April 30, 2009. Rodríguez, Montané, and Pulitzer, Daughters of Juárez, 41. This is really AMAZING! I find femicide in Juarez very interesting. I would love to go there just to see the culture and to get the chance to speak to some of these beautiful women. I really love the pink crosses they set up. I don’t know, everything about this has my entire attention!